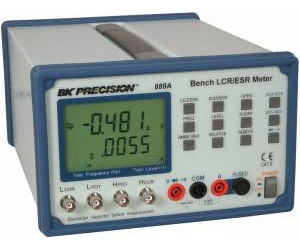 The B&K Precision Model 889A Synthesized In-Circuit LCR/ESR Meter with Component Tester is a high accuracy test instrument used for measuring inductors, capacitors and resistors with a basic accuracy of 0.1%. Also, with the built-in functions of DC/AC Voltage measurements and Diode/Audible Continuity checks, the Model 889A can not only help engineers and students to understand the characteristic of electronics components but also be an essential tool on any service bench. Includes DCR and ESR measurements.